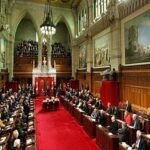 HRANA News Agency – There was a research panel with 9 Canadian Senators’ speech, and Iranian guests and international human rights figures, held for three days in Canadian Senate, from May 10th. This is a short report of this meeting. HRANA News – All public phone line of Sanandaj prison was shutdown since yesterday and concerns about the execution of Habib Latifi has been increased. HRANA reporters, Due to the lost of phone service at all Sanandaj central prison’s wards, despite the extensive efforts made to confirm the wellbeing of Habib Latifi’s until now was unsuccessful. Families of other political prisoners incarcerated in the prison could not manage to contact the prisoners. HRANA News Agency – in agreement with the promise given to the family and protesters in front of Sanandaj prison, family of Habib Latifi met with him in the prison. According to HRANA Reporters, The family of this prisoner who was waiting from 5am in front of the prison for the head of the prison to keep his promise was able to meet Habib Latifi at 9 am in the prison. During brief talk with Elaheh Latifi (sister of Habib Latifi) to HRANA; she thanked and congratulate the Iranian people and confirmed the news of the political prisoner’s execution postpone. Habib Latifi is the student of Eylam University- industrial engineering was detained on Oct.23rd 2007 and tried by the Revolutionary Court on 2008 and sentenced to death on charges of waging war against god and corruption on earth. The Judiciary system announced that the sentence issued based on the sound bomb explosion recorded on mobile device and his confession, while Habib denied all allegations in the court and claimed that confessions obtained under torture. HRANA News Agency- The following is a brief biography and summery of Habibullah Latifi’s case; Habib Latifi is a political prisoner sentenced to death and held in Sanandaj prison. His brief biography told by his relatives and edited by Kurdistan Committee for Human Rights Activists in Iran this brief provided to inform the general public of his case.